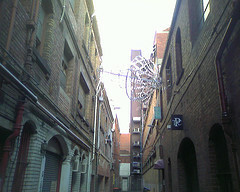 Quick one today – check out this ‘street chandelier,’ which I saw being installed in a small lane off little bourke street a few days ago. Similar to the ‘hanging safe’ that used to be just of Tatersals lane. Still though – I like it…Can someone get a shot at night?